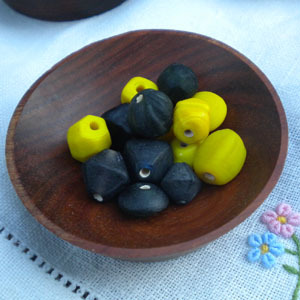 How do you make three different size (small, medium, large) beads from the same magazine page? 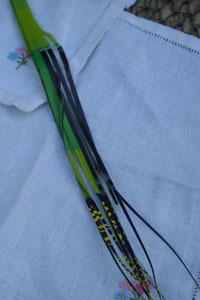 I find that rolling two triangle strips together with the paper bead metal roller, makes a bigger rounder bead. Stacking three strips of the same size and length will make a bigger bead. I am very happy with how these beads came out after dipping them in Vibrance three times. First, cut triangle strips, preferable from a glossy magazine, with dimension: 1/4 inch at the base, about 17 inches long or the whole length of two pages of an open magazine section. Smallest bead as shown above is made from one strip, medium bead from two strips, and big bead from three strips of magazine triangle rolled together as one. 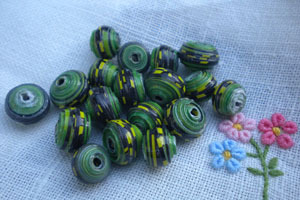 I chose a magazine page that has a pattern of black, green and yellow to go with these India glass beads. I strung it on .8mm elastic and made a bracelet. The pattern on these beads remind me of turtles and I just love turtles and what they represent: longevity, endurance and patience. I would like to take a little survey on what you do with your paper beads. Make jewelry with it? Just give it away as gifts to friends or sell it? 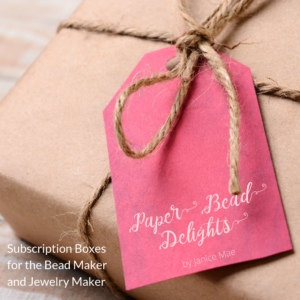 Do you wear your paper beads jewelry? Have you made so much and you just don’t know what to do with it? 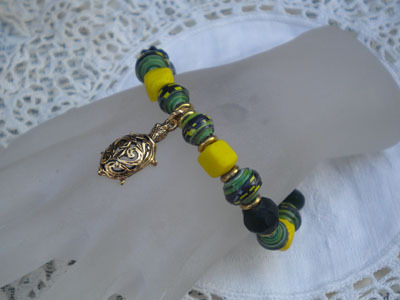 I will be giving away my little paper bead bracelet when I will have at least 20 comments or emails. Well I have to be honest, I hadn’t heard of paper bead making until yesterday! I was looking on Amazon (UK as that’s where I live) for quilling books and came across a childrens paper bead making kit. I got curious and started doing some research and that’s how I found your site. I can’t wait to try this, the bracelet is exquisite, I could never hope to be able to make anything that beautiful but your tutorials have inspired me to at least get started and for that I am truly grateful. I use mine to make jewelry, give to my grandkids so they can make jewelry, sell the them to ladies at church. I like to use our church bulletin to make beads out of. I have made approximately 2000 beads to date. I find it relaxing and I really love seeing how they turn out based on the paper I use. When I go out shopping (especially to craft stores) I am on what I call “paper alert”. I am constantly evalutating paper that could potentially become a beautiful bead. Cathy if you send me your address I would love to send you a bag of beads. Or send me an email @ sms4jc@hawaii.rr.com. I have a son in the Peace Corps and stationed in Indonesia. He is in a very small village with several “little rascals” that follow him everywhere. Travis is 6’5 and by far the tallest person they have ever seen. I thought I would send him beads that he and his “little rascals”, who are tying to learn english, could string and give them to their mothers, grandmothers, or wear themselves. Anyone with extra beads that would like to send them to the Peace Corps in Indonesia please let me know! I make jewelry for myself and for my friends. Once I’ve had plenty of practice, I’m hoping to make jewelry to sell! I <3 your website…i go on everyday to check out whats new. I make jewelry for my friends and family as gifts and i am actually making beads for a bracelet that is for my cousin that is getting married. I love to show my friends the jewelry i make and they cant believe its paper!!! I have so many paper beads that i had gotten a very large bead organizing container and i need to go and and buy another one or its going to explode with paperbeads!!!! my favorite thing to do with the paper beads is to incorperate sea glass i found at the beach near my house in it…Thank you soooo much for this my awesome new hobby. I love your website! Thanks for all of the inspiration. I, too, cannot seem to stop making beads and fear I have more than I can use. I usually make beads from magazines for friends and family who are always SO surprised to hear I made the beads. So far, I have made bracelets and necklaces on elastic….. I’m very tentative/nervous about trying “actual jewelry making”. 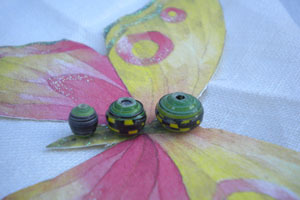 I read about the new Vibrance paper bead glaze and think it would be great for my paper bead making. It’s so tedious to hand glaze each bead. Does the Vibrance have to be diluted in water for use? I make jewelry for my (just starting out) business. I spend a lot of time making beads and love to work with different types of paper – old fliers, magazine pages, envelopes, junk mail, scrapbook paper. 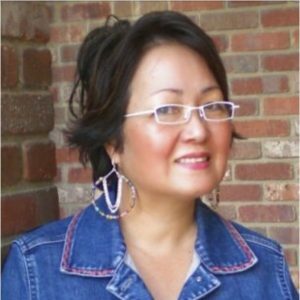 I also wear my pieces, whether it is a necklace, a bracelet or a pair of earrings – I figure that is my best advertising! I like the idea of rolling several triangles together. I’ll be trying that next! I use my paper beads to make jewelry for myself. My favorite mediums are scrapbook paper and scraps of wallpaper. Eventually, I would like to sell the jewelry that I make. Anything that I now make, I want to keep. I just recently discovered paper bead making, via your website. I love it and have got several friends and family members into it also. My favorite medium is scrap book paper. I like to make bracelets and earrings. I do wear it almost every day. I would love to make beads and jewelry to sell, but have no idea how to get started. Thank you for all your inspiration. I made many jewelry and some other craft stuff with watching the tutorials your posted, they are very inspirational. 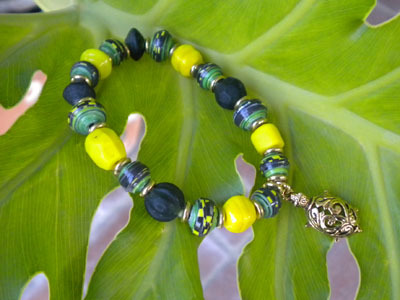 I love to make paper beads and paper beads jewelry, it relaxes me and makes me happy. Every time i make some new beads i love the suprise how they come out :D.
I make jewelry too, but not a lot, I also use paper beads to ornate gift wraps, or I make mobiles combining paper beads with origami. Also I do wear my paper bead jewelry. I’ve sold a lot of my creations, and I also use it to decorate my frames, and around the room. I am just beginning and found this site while surfing the web. It is so helpful and everyone has great ideas. I would like to make some for gifts then as I get better I might try selling some. The bracelet is absolutely beautiful. I love the ocean and it reminds me of something tropical. i enjoy making them, ilove choosing the colors and experiment the sizes, i wear them a lot too and i make some for my friends most of them become paper beaders too! everytime i open a magazine i get excited with the colors of the pages, not with the content, hahaha! i cant help it!!! I like to make jewelry that I sell or make for friends. My sister is my number one customer! 😉 I have quite a few bracelets myself. I do wear my paper bead jewelry. I am sad to say, but I haven’t made too many beads! I make jewelry with it. I give some away to friends and relatives. I also wear a great deal of it myself. And yes, I have a LOT of it. So much so that I have a whole box of it in the closet that does not match my current wardrobe. I never thought about it, but there must be many of you that keep making more than we can possibly wear. It’s so much fun that it’s hard to stop.